You’re thinking about selling your home. Maybe you’re retiring, downsizing or a major life event has made you consider a move. 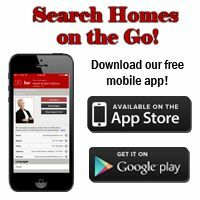 As Senior Real Estate Specialists® we have unique training, experience and a team of professionals that can help home sellers and buyers in your situation. Ingrid and John Sullivan are “Baby Boomers” who have helped their parents downsize and make the transition from their homes to senior living communities. Because of our own personal experiences, we can empathize with the challenges families face when making this life changing move. That is why helping families with this transition is one of our passions. Why Choose the Sullivan & Sullivan Team? As Senior Real Estate Specialists®, we understand that the decision to sell your home can be difficult and emotional. The Sullivans understand issues facing maturing adults. By taking a no-pressure approach, we can help you navigate your choices. Ingrid has achieved the prestigious Certified Senior Housing Professional (CSHP)® designation from the Seniors Real Estate Institute awarded only to a select number of real estate professionals in any market. We will patiently support you through each step. As your advocate, we are focused on looking out for your best interests through all aspects of your transition, not just the sale of your home. We will tailor the process to your specific needs. We have ties throughout the 50+ community and are familiar with active adult and community service organizations in your area. Ask us for referrals to a variety of resources that are knowledgeable about local senior housing options. You can count on The Sullivan Team to guide you through the process of selling your home, making the transaction less stressful and more successful. Selling a senior’s most valued and valuable asset, their home, and the subsequent move can be overwhelming and complex. 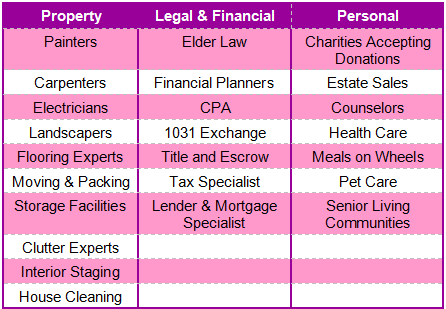 Often your move requires the unique expertise from a number of different professionals. Whether you’re a member of the “Greatest Generation” or a “Baby Boomer,” one compelling reason to choose the Sullivan Team is that you’ll gain access to our network of related service professionals.